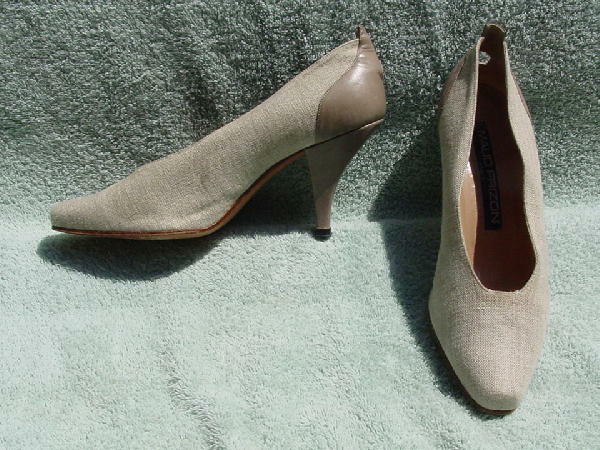 These wheat colored fabric (feels like a linen mix) and light taupe soft leather pumps are by Maud Frizon Paris. They have leather soles and light tan leather linings and insoles. The leather of the back heel of the foot is 3/8" higher than the fabric and there is a 1/2" wide square cutout in the foot back. The leather heels have some scuff marks and a small indentation in the heel of the left foot and an indentation/dark mark on the left heel. 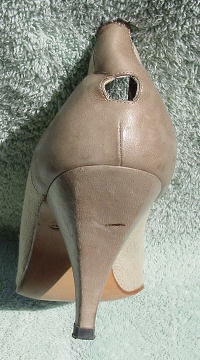 The left shoe vamp has a small slightly dark area by the center edge. They have modified square toes.